EMPLOYEES – CHECK YOUR WEAPONS AT THE DOOR! Illinois became the last state to pass legislation authorizing the concealed carrying of firearms by enacting the Firearm Concealed Carry Act. What does this mean for employers and what is the rule for having guns in the workplace? The Act allows a concealed carry license holder to carry a loaded or unloaded firearm fully concealed or partially concealed on or about his person or his vehicle. 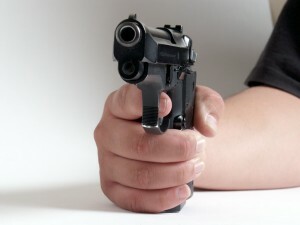 In order to obtain a concealed carry license, the individual must be at least 21 years old; have a current Firearm Owner’s Identification card (“FOID”); not have been found guilty of a misdemeanor involving physical force or violence or two or more DUI violations in the preceding 5 years; not be subject to an arrest warrant; not having been in a residential or court ordered treatment program for drugs or alcohol in the last 5 years; and complete 16 hours of firearm training and education. Before employers start running for the doors believing their places of business will become a haven for gun toting employees, there are a few items that need to be addressed. Employers can, under the Act, prohibit employees from bringing concealed weapons into the workplace. This requires the placement of 4×6 inch signs – which must be approved by the State Police – at the entrance announcing that firearms are not allowed on the premises. Oddly, the Act does not permit an employer from prohibiting an individual from carrying or storing a concealed weapon within a vehicle on the employer’s parking lot. Individuals are also not prohibited from carrying a concealed weapon in the area immediately surrounding his/her vehicle for the express purpose of storing it or retrieving it within a vehicle’s trunk. What does all this mean for an employer? Prudence suggests that employers immediately post approved signage indicating that concealed weapons are not allowed anywhere on the premises. Employers should also immediately review their policies and procedures to include a “no weapons” policy. If an employee is arrested for carrying a handgun or other concealed firearm, check to see if they are licensed to do so under the Act. If not, after a conviction (not an arrest), the employee’s employment status should be carefully evaluated since there may be a safety concern. For more information about establishing employment policies, contact Bill Boznos of our firm.